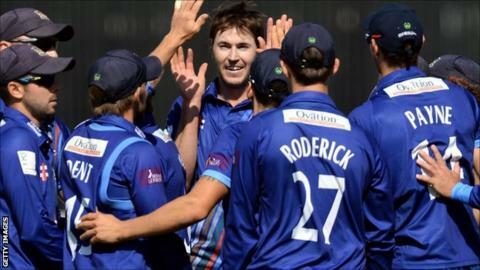 Gloucestershire legend Jack Russell has urged his former side to embrace the pressure of playing in a Lord's final. Russell played for the County for over 20 years and was in the one-day side in what was a golden age for the club. And the former England wicketkeeper hopes the current crop of stars can perform when they take on Surrey in Saturday's One-Day Cup final. "You've got to go for it, embrace it, you can't freeze," Russell, 52, told BBC Gloucestershire. Russell also gave a insight into playing in a showpiece final at Lord's for the first time, which will be a new experience for the majority of the Gloucestershire side. Another former England wicketkeeper Geraint Jones is the only player with experience of such an occasion. Russell added: "There are lots of nerves. You come out of the changing room, you wander through the Long Room and all the members are clapping you, a lovely gentleman holds the gate open for you. "You go out through the gate and on to that lush lovely grass and that is where we felt we were at home. We were happy. "Nerves make you focus and once we were on the green grass we knew our job, no one was afraid to fail. There was no fear." His message his simple: "Give it your best shot and if you have a great day you will remember it for the rest of your life. When you win, you enjoy it for the rest of your life and there is no better feeling." Russell also believe captain Michael Klinger is key to their success at the weekend. "He came in from Australia, he turned out and he led the chase in perfect fashion," said Russell. "He acts like a gentleman, he is a special character. He is a focal point and he has to have a good day if Gloucestershire are going to do well. "They all look up to him, he is a great leader. Nothing fazes him."